It would seem that my hoping for a better day for all of you lucky enough to be able to enjoy it has paid off. I have had a bumper crop of visitors to the gallery today. It has set an all time record for Saturdays with 32 people coming through the door. Many lovely people that I have had some great chats with. I have been drawing most of the day and I'm still not quite at the point that I want to be at in terms of taking it to the next stage. So it remains a work in progress. If you were wondering why my blog is titled the way it is....it's because yesterday I totally forgot to put a title on it. I think there is a word that perfectly describes how I feel at this precise moment. Gormless. What's funny is that blogspot's spell check does not recognize it as a word. But it doesn't recognize blogspot either. For anyone who does not know what gormless means here's the dictionary definition. Lacking in vitality or intelligence, stupid and dull. You might think that I am being unnecessarily harsh but you can't see me staring out the door with an expressionless face in between each line that I write. It's the last hour before going home which always seems to last at least three hours. Tomorrow will be my last free Sunday for some time so I'm going to try and make the most of it. The way I'm really going to help myself is by not going out tonight. I hope that you all have a great weekend and that the sun will shine for both me and you tomorrow. 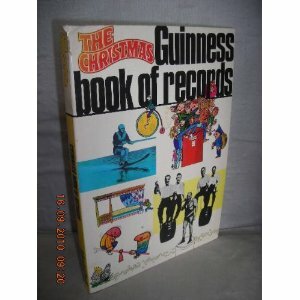 Footnote: The Guinness Book Of Records picture is from the 1970 edition, which is the year I was born. Tell You Why I Don't Like Mondays! Never Could Do Anything I Was Told! Do You Want To Hang Out With Me? P.A.W Rocks More Than Old Harry!